There’s plenty of talk around why companies urgently need to innovate in order to survive the disruptive and competitive forces of today’s digital age. You’ve seen the memos from top management – nurture innovation, reward risks, fail fast – but for many organisations, success still seems out of reach. Many think a design thinking workshop could get people to start innovating and bring in the magic of ‘being innovative’ overnight in everything they do. That couldn’t be farther from the truth as Carol Dweck, the eminent Stanford Psychologist, writes in her ground-breaking book “Mindset: The Psychology Of Success,” companies that have seen success with innovation had one thing in common – their employees displayed in what she calls a “growth mindset” as opposed to a “fixed mindset”. Thinking like an innovator and a shift towards a “growth mindset,” a prerequisite to an innovation mindset, IS possible and is absolutely essential if companies hope to see innovation. And this journey of mindset shift must come before companies spend their dollars on innovation tools training or any other innovation-related frameworks. How many times do you hire or develop teams for traits like: “Has an ability to be curious; Questions old vintage processes and perspectives; Able to actively observe the world around; Has a strong dislike for status quo; has a desire to change the world? Well, these traits are only the starting point. The first step on this ‘critical mindset shift’ journey will always be the growth mindset. Among other attributes, growth mindset is the fundamental belief that talent and abilities aren’t predetermined or “fixed”. Given the right learning opportunities and a growth-minded culture, employees – even the ones who aren’t the most obvious high-performers or “stars” – have the potential to meaningfully lead and be the source of innovation. As is evident from many innovative organisations, the growth mindset usually starts at the top – its leaders and managers need to do an honest reflection of their own mindsets before expecting innovation miracles from their teams. So here’s what you need to do as a leader in order to move away from a fixed mindset to a growth mindset. Natural talent is highly sought-after in sports. Though over and over again, the athletes who initially showed rather depleted or lower levels of raw talent are the ones who shine and come out on top later. Michael Jordan was one such example who was thrown out of his high school basketball team. What enabled him to become the most revered basketball player in history was his mindset—a belief that he was capable of learning and improving his ability. Do you believe that certain skills and abilities are ingrained and only talented “star performers” can effectively contribute to the company’s growth and innovation? Do you use words like competent and incompetent to judge people’s abilities and frequently overlook any improvements in performance because you can’t get past your first impressions of your team members? Do you make those first impressions of people based on appearance and their style of speaking instead of the content of their message and subsequently tick them off your list as you selectively validate that opinion in future encounters? Then it’s likely you have a fixed mindset. Leaders who have a growth mindset believe that people have the capability to improve their ability and actively encourage learning to expand their employees’ abilities beyond their current capabilities. Are you checking and killing your bias or just striking those Michael Jordan’s off your team? When was the last time you invited feedback from your team on your own performance and ideas as a leader? Do you subscribe to the belief that doing so undermines your authority and that hierarchical organisational structures and pecking orders are sacred and must not be challenged? A growth minded leader is secure enough to not only handle constructive criticism but is humble enough to admit mistakes and make necessary changes to pave the way for the right culture required for innovation. How many times have you heard yourself saying “That’s the way we’ve always done things” when your team members have walked up to you with a new way to do something. This single dialog is the biggest inhibitor to bringing growth and innovation in the organisation and is just a blind acceptance of what I call ‘mediocrity’. Are you inadvertently stuck in the “my way or the highway” approach when it comes to managing your team? Are you controlling and micromanaging every aspect of your team’s performance, giving them little breathing room and space to come up with their own ideas and take risks? Research shows that giving ownership is key to developing leadership abilities and the risk-taking culture crucial for establishing the culture of innovation. As Steve Jobs famously said, “It doesn’t make sense to hire smart people and then tell them what to do; we hire smart people so they can tell us what to do”. Humans cannot not think. At best they could be thinking in a different direction. In my experience as an Executive coach, I have heard many senior leaders say “My people can’t think”. Now that sounds counter intuitive to being a human being itself as Dr. Bali also shares. Let’s imagine, If I ask you to think about ‘Dancing Hippopotamus’, you would be thinking about ‘Dancing Hippopotamus’ and not a ‘Dancing Monkey’. The question for you as a leader is: Are you guiding them to think about Hippopotamus, Monkey or just not giving them anything to think at all? The job of a leader is to be that lighthouse to share larger vision, show light towards the direction the team should be heading to and then eventually creating an environment where the team feel empowered to freely express their thoughts and take ownership of the outcomes. A singular focus on outcomes is the enemy of innovation. How are you incentivising your teams to take risks and challenging the status quo? Google, famously allowed its employees to dedicate 20% of their time on personal projects, which has been the source of many innovative ideas at the company. Many leaders contend that Google is Google and it’s not possible for them to give 20% of free time to employees. While not everyone needs to copy that model but it’s important “to start somewhere” and make the space to innovate. At Microsoft, which has actively imbibed Dweck’s findings on growth mindset, CEO Satya Nadella encourages constant learning and development at the organisation, a strategy which has helped the company triple its value since its introduction. Nadella even releases a video every month on what he has learnt. In many ways, you may need to let go of your “Oh, I am the manager, I need to know all the answers” mindset and become a coach and guide to your team members. You will need to move from “telling” to “asking” to make an idea-rich and empowered team. Asking introduces variation, which yields to more creativity and innovation. Asking means that you are actively seeking out your team members’ interests and investing in your team members’ learning. Genuine and constructive ‘asking’ indicates that you value their ideas/opinions and you want them to think independently. As a leader, when you are asking, you are given options and approaches that might be very different from your ideas. Acknowledging those different ideas and accepting that those ideas might be better than yours will result into an innovation culture. 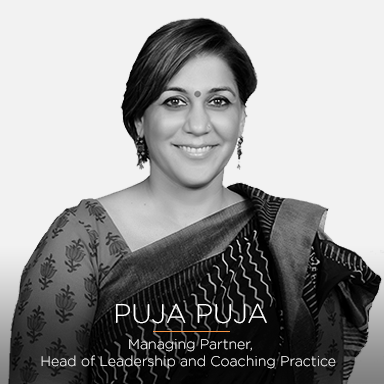 Puja Puja, Managing Partner, Head of Coaching & Leadership Practice at Recalibrate Pvt. Ltd.
Puja is a Columbia University certified coach and is acknowledged by business leaders and executives for connecting them and their organisations to their inner compass and helping them find their true purpose and mission.